According to a new study report, called ‘Digital Bait‘ commissioned by the Digital Citizens Alliance (DCA) and conducted by cyber security firm RiskIQ says that after examining a sample of 800 piracy sites dedicated to distributing stolen movies and television shows, the found that one out of every three content theft sites contained malware. The study also found that consumers are 28 times more likely to get malware from a content theft site than on similarly visited mainstream websites or licensed content providers. According to the study, about 45 percent of malware payloads found on the sample piracy sites are make its way on to a user’s device through a ‘drive-by-download‘, which means malware downloaded invisibly in the background and didn’t require user to confirm the downloads. That means merely visiting piracy sites can place a users’ computer at risk because users didn’t need to need to download media or click on any popup advertisements to become a victim. The remaining 55 percent of the malware lured users with fake prompts for requests such as Flash downloads and anti-virus updates and interestingly many of these prompts look virtually identical to prompts from the actual legitimate providers of such services. “It’s clear that the criminals who exploit stolen content have diversified to make more money by baiting consumers to view videos and songs and then stealing their IDs and financial information,” — Executive Director of DCA Tom Galvin said in a statement. Trojans by RiskIQ’s malware analysis tools. ‘Trojan’ is the general term for any malware that secretly installs itself to open unauthorized access to a computer. 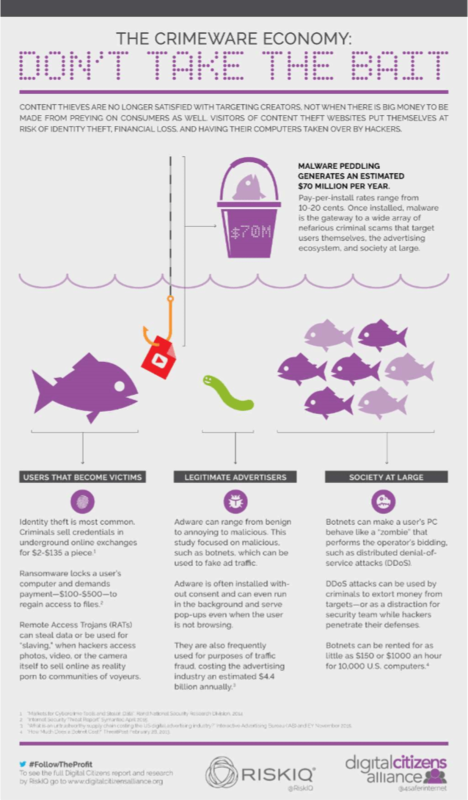 Adware can range from benign to annoying to malicious. Adware detected by the anti-virus tools in this study was weighted toward the malicious end of the spectrum. And lastly they also found ‘Other’ minor categories and instances where an exploit kit was detected but the malware type was not determined. Once the malware is in place, criminals are able to steal bank and credit card information, find and share private information, lock a computer and demand a ransom or even take control of the computer to commit acts of fraud while framing the owner of the computer. According to RiskIQ, each month 12 million U. S users were being exposed to malware attacks from specific piracy sites they visited in the Sample Content Theft Group, based on Alexa traffic data and RiskIQ’s measure of malware incident rates. Content theft, or piracy as it’s commonly known, poses a serious and under appreciated threat to Internet users by exposing them to harmful malware that can lead to identity theft, financial loss, and computers being taken over by hackers. So be careful while surf online. If you want to know more, you can read the study on DCA’s website. So now onwards simply avoid malicious piracy sites and protect yourself. Don,t be a victim because one of the most interesting claims in the study is that content theft sites are 28x more likely to contain malware than a legitimate site. So what do you think about the study report. Does it be helpful for you to stay safe while browsing the web ? We’d love to hear from you in the comments!